High pressure will bring sunny skies and temperatures in the low 70s to the Finger Lakes on Thursday. 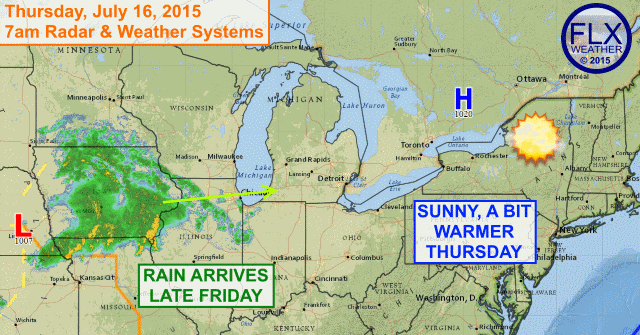 More active weather moves in by late Friday. Sunny skies and warming temperatures, thanks to an area of high pressure, will make Thursday quite enjoyable for the Finger Lakes. Temperatures are quite chilly to start the day, but should quickly warm with the bright sunshine grading our region today. Highs should top out in the low and maybe mid 70s this afternoon. 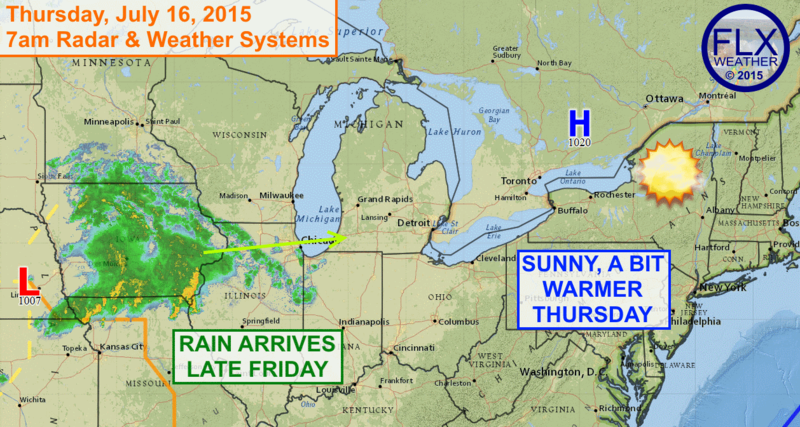 Some clouds will start to work in on Friday as low pressure moves towards the region from the Midwest. By the late afternoon on Friday, some showers will also start to appear in the area. Temperatures will be warmer on Friday though, with highs in the upper 70s. Rain is more likely overnight Friday and into the pre-dawn hours of Saturday. A few showers may linger into the daytime on Saturday as well, but the sun should start to return by later in the day. Temperatures will push towards 80º despite the limited sunshine. Even with clear skies overnight, temperatures should start Sunday in the upper 60s to near 70º. Sunny skies and southerly winds will quickly boost temperatures into the 80s, with highs Sunday afternoon approaching 90º for some areas. With the heat and a good does of humidity as well, some afternoon thunderstorms will be possible. More thunderstorms, some with heavy rain, will be possible Sunday night and into Monday.